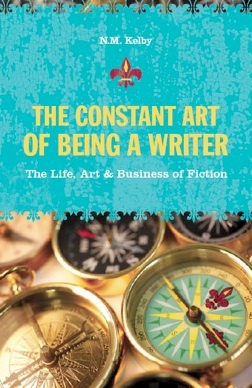 So starts the wonderful book —The Constant Art of Being a Writer: The Life, Art & Business of Fiction by N. M. Kelby, the award-winning novelist and short story writer. Even though this book deals mainly with writing fiction, writers of other genres will also benefit tremendously from this book. The book is divided into three parts—The Life, The Work, and The Business. The first part—The Life—explores how to live the life of a writer. It explores the issues like how the writer’s life and the lives of people close to him change and how to adapt to such a life. It explains why writers write, even at the risk of losing everything they hold dear. This part also gives practical advice on how to set up your writing practice, emphasizes the need for a writing space and how to design one for you, the importance of writing regularly and creating a routine, etc. It also deals with topics like how to read as a writer, what to read, how to capture your thoughts and ideas, how to review books you have read and learn from them, how to create your support system, whether to join a writing community or create one, etc. You will also find topics like the importance of understanding your reader and how to do it, techniques to overcome the writer’s block, how to develop yourself, tips on how to apply for grants, fellowships, residencies, etc., whether to quit or keep your day job, how to manage your finances, why you should never give up, etc. The second part—The Work—deals with the craft of writing. It starts with advice on how to generate ideas for your story and moves on to details like creating and developing characters, choosing the style, voice, tense, and point of view for your story, and how to structure and build the plot—beginning, middle, and end. This part also explores the different writing styles like magic realism, metafictive structure, and humor, how to create the outline of your story, how to research for your work, how to revise and fix problems, etc. One of the best chapters in this part is on creating bestsellers—tips on writing, presenting, targeting, marketing, and promoting your book so that it becomes a bestseller. This part also deals with tips on improving your visibility by sending the work for contests, sending them to publications for reviews, etc. The final part—The Business—deals with the issues like agents, whether you need them, finding one that is right for you, dealing with them, etc. It also addresses the topics like contracts, your rights, what to look for in the contracts, how to sell your rights, and tips on negotiating great deals, This part deals with how to handle poor sales, how to improve the sales, how to deal with publicity, how to avoid burnouts, how to promote your book by creating your website, using images and videos, creating book trailers, blogging, networking, etc. There is an excellent chapter on book tours, book fairs and festivals, bookstore appearances, and tips on how to make the best use of these promotional activities without wasting too much of your time. It also deals with whether or not to employ a publicist and how to deal with her. This part also examines the pros and cons of self-publishing and gives useful tips and advice. Then there are two appendices: one is a glossary of publishing jargon and the other is a list of books that will inspire and motivate you and keep you going (the surprising omission being On Writing Well by William Zinsser). One of the best advices of the book is in the Introduction—Never waste a word on the page. This is a MUST READ for every writer.